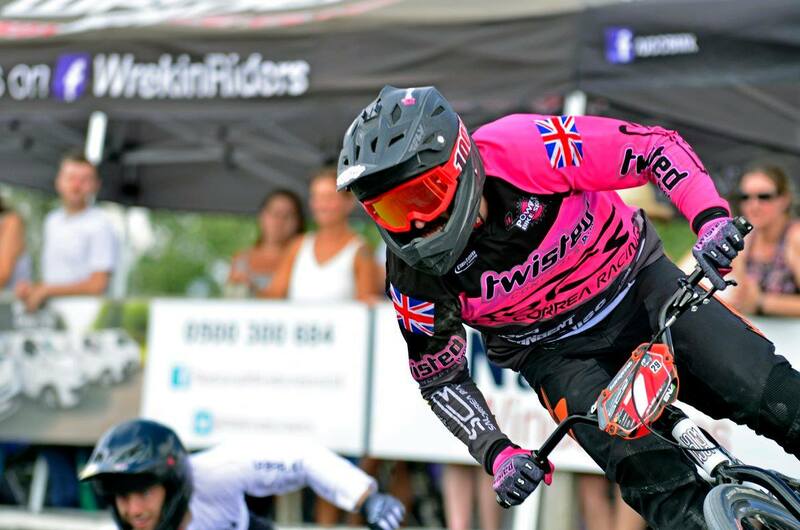 For the latest round of the HSBC British National Series the team rocked up to Telford. It’s been a couple of years since we’ve had a national at the Midlands track and we were really looking forward to it. Most of the team know Telford track pretty well and a lot of us had ridden the last regional there. We had also privately hired the venue for a team training session not that long ago, so the homework had been done. The last time we raced there, gazebos were destroyed overnight (luckily not ours) and wind had caused absolute chaos, so sandbags were packed as ballast, but we wouldn’t need them as the weather was glorious, the sun was shining, and the wind didn’t get more than blustery. The track is located on a hill by the Wrekin and has stunning views looking over Wales. Originally constructed by Clarke and Kent, it’s been tweaked lately, but remains like the original build. It’s quite short for a national standard track, with huge corners and invites action packed racing, with plentiful passing opportunities. After the last few venues with sharp 5 metre hills Telford’s seemed pretty mellow, but that helped show who had the best technique, snap, power and cadence, it also boasts of fastest start gate in the country and Bensink barrel gate you couldn’t hit if you tried. The first straight has a long low set of doubles, best pumped or manualled, then a step up/step down, slightly toughed out, making it a tricky manual for some and best jumped, which was fine on the Saturday, but harder on the Sunday when a tricky headwind picked up. The first berm is huge, with a super-fast inside passing line for the brave to drift out wide on the exit and block the line of the riders railing it, rather like Manchester Indoor. The second straight has another medium sized set of low doubles best manualled, then splits into a tricky step up table and big step up into the second berm on the inside, on the outside is a pro section that is just a pumped-up version of the amateur side with grass in the middle of the jumps. Turn two is pretty steep, most riders keep as tight as they can to the pro section on the inside, not to give anyone a chance to get under them into the third rhythm straight. The third is a succession of step ups and a table, not hugely technical, but easy to get wrong with the speed you’re carrying from the big corners. The final berm is super steep asphalt wall of death, where the moves come thick and fast, it really is a do or die turn, seeing lots of riders put into the grass exiting onto the final straight, or even put up into the wooden safety fence. The final straight is a pretty tricky and very peaky rhythm section, two sets of rollers to step ups, a final triple, which for the very best riders it’s possible to triple up all the way through. The team gazebo was the usual spacious triple set up, situated halfway down the first straight, providing us with some of the best possible views of racing at the tight venue. It was lucky we had the room, as all weekend we were inundated with visitors looking at our signature carbon rims, buying our super comfy signature FIST gloves and discussing some very exciting developments on the team front. Friday practice went well for the members of the team that arrived in time to do it and we were all set for the weekends racing. 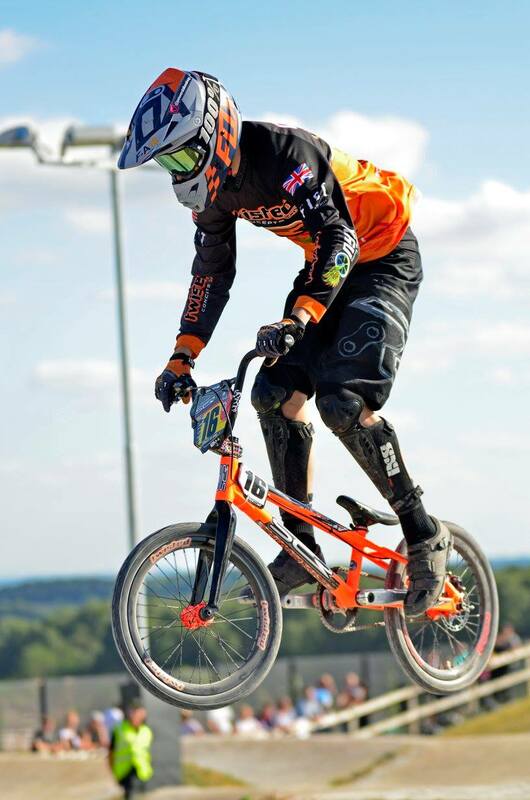 We had a very special guest staying with us too, Tonn Hayden from our Australian team was here to get in on some UK BMX action in the 25-29 men category. Our backpacking Aussie had come to Europe via the World Championships, traveling around the more Eastern side of Europe taking in as many tracks and races as he could, and eventually ended up in England a few days before the event. Only Nathan Konggutong was missing from the current factory team line up, he’s been busy in his native Thailand winning the Junior Elite title at the Thai Championships, huge congratulations to him for that. So how did the Twisted crew get on? Harry really likes Telford track, especially the more mellow start hill and he’s a big fan of the technical last straight. It showed on the Saturday when he battled though his moto’s, getting some great mid pack finishes, driving well though the rhythm sections and getting lots of overtaking done, and being rewarded with a place in the quarter finals. 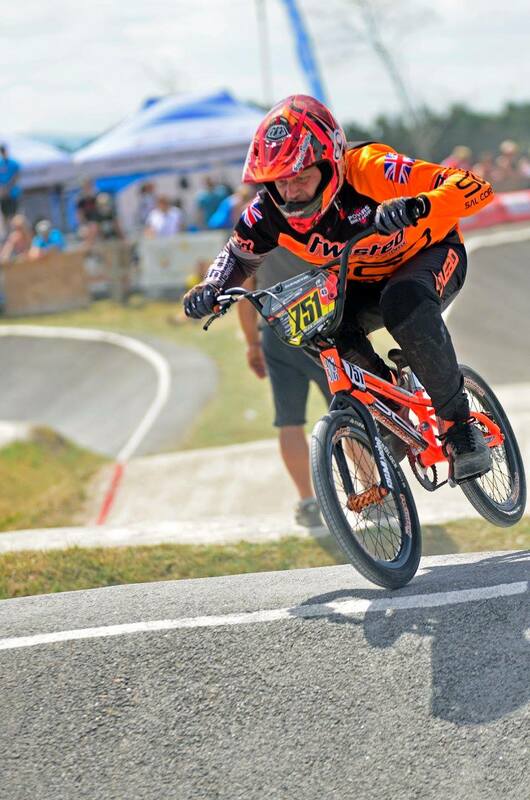 His quarter was a chaotic affair, with crashes and incidents galore, but he stayed composed and cut though the pack after a poor start, unfortunately he could only make his way up to 5th place, his best result at a national. 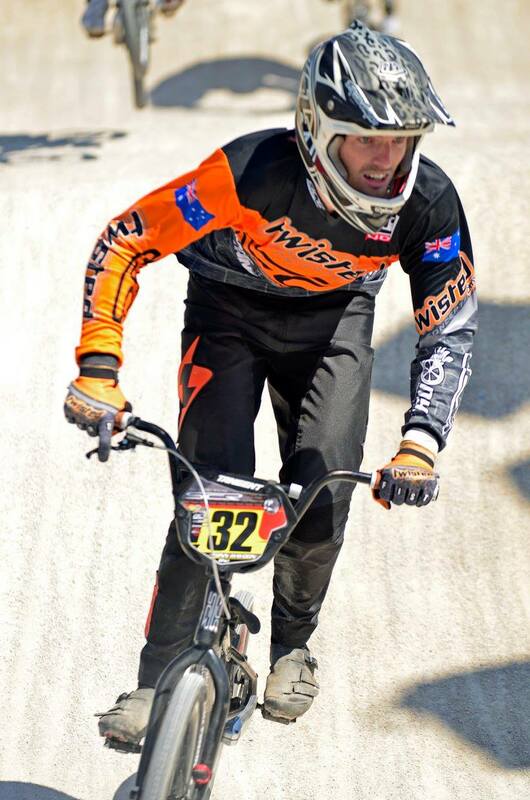 On Sunday he couldn’t quite match the previous day’s performance, struggling in the heat and getting some super tough moto draws he missed out on the cut to the knockout stages and went out in the motos. We think he can definitely make the semis if he can just believe in himself a little more and be more assertive in the berms. He’s going to be working hard on his consistency on the gate too, something that can let him down on the bigger stage. He has some good race practice for Gosport national coming up, as there’s a Southern regional he’s attending in the build up to the event, and if he can get it right he’ll hopefully progress further and get even better results there. Fresh back from her under 16 girl’s cruiser E3 adventures at the European Championships in Sarrians Princess Morgan was super up for the job at Telford. 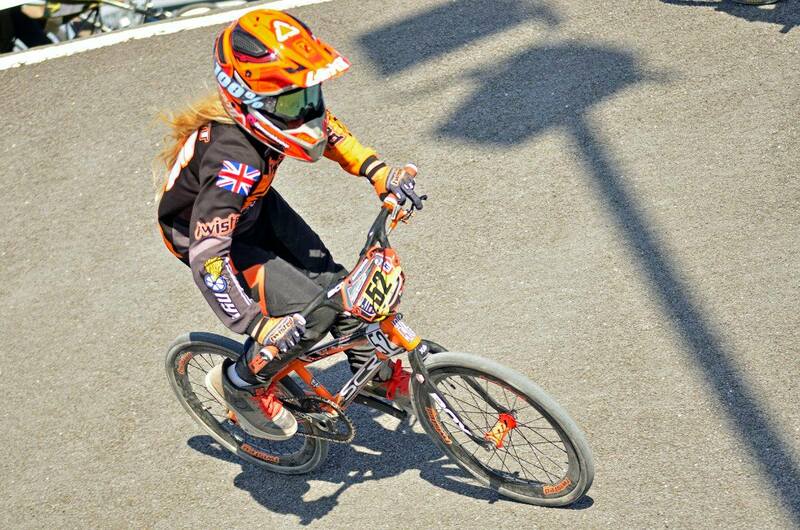 She said has always enjoyed racing at Telford as “the track is quite fun and it’s a jumping track – just what I like!” Friday practice was fun and was much needed as she had just returned from the Euro Champs in France, and it was over a week since she had been on her bike. This national weekend she was back to racing both cruiser and 20”, a tough ask in the draining heat. 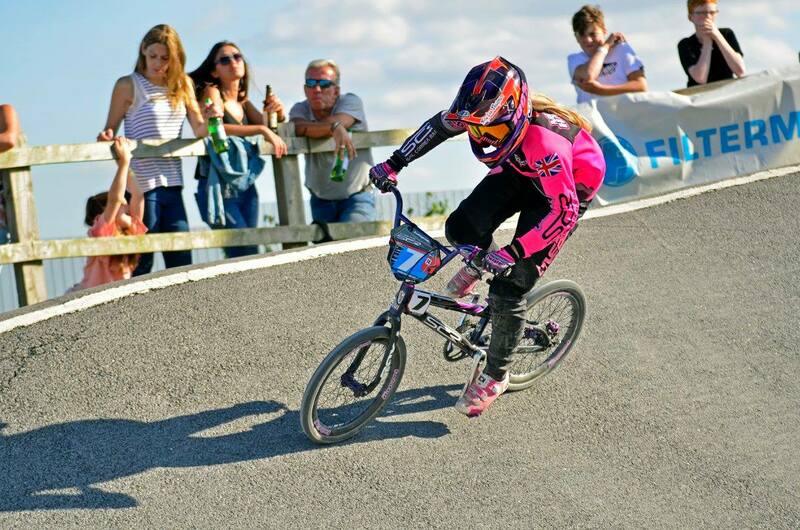 On Saturday she found the cruiser racing tough, being one of only two girls racing a category stacked with the boys. In the motos she got 5th, 6th, 5th making the B final. On the 20” she raced well, getting 1st, 2nd, 2nd in her motos, 3rd in the semi. She got a bad gate in her final finishing in 5th, not as high as she’d hoped, but Morgan has high expectations of herself. Ben is a fan of the Telford track, so he was excited to be at the National event. He decided to compete in both 20” and Cruiser on Saturday, but opted for Cruiser only on Sunday. His first Cruiser race and Ben got a great start, mid-pack at the end of the first straight. After a few battles, he crossed the line in 4th place, which was a great result for him. Unfortunately a re-run was announced due to a fallen rider from the previous Moto and in the re-run Ben got 5th. After his second and third Moto, Ben was 1 point away from moving into the semi-finals, so was gutted that his best result hadn’t counted! 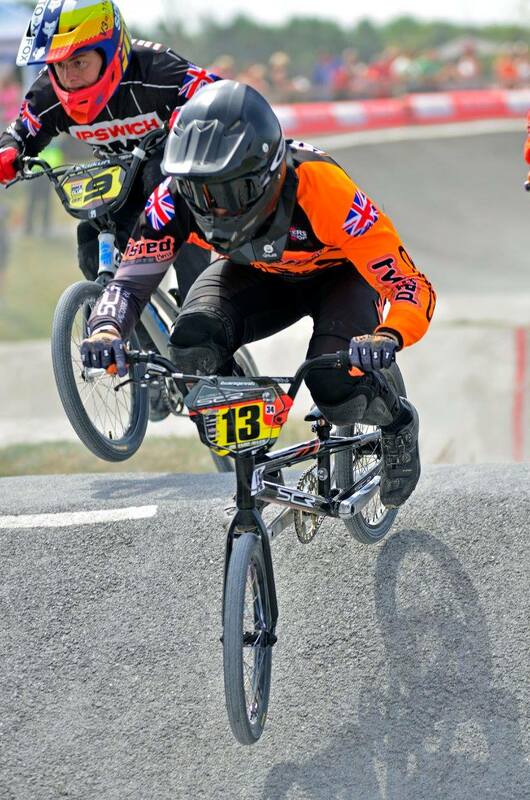 The fallen rider, Zion Poulter, is a good friend of Ben’s, so although Ben was disappointed that the re-run had cost him his place in the semi’s, he was concerned for Zion and relieved when he heard he was being looked after in hospital and, despite having a broken leg, was doing okay. Heal well Zion! As Ben has not spent a lot of time on his 20” this year, his results were to be expected and he did not progress beyond the Moto round. On Sunday, Ben was riding Cruiser only and had some great mid-pack battles in each Moto. The class covers age 9-12, and although Ben is 11 years old, he is rather small for his age and for now, lacks power. In his third Moto, he was riding against 7 of the 12 years olds in the class, all of whom are considerably larger than Ben. However, Ben takes it all in his stride (in Midlands regionals he is riding Junior Cruiser, which means he rides against some huge 16 year olds! ), and he is making progress. His technical ability is really improving, he just needs to get some power in those little legs! The weekend started off with some pre-event nerves for Finn, as this track has never been the kindest to be fair when it comes to results. Friday practice wasn’t going to plan with gates being an issue, until Aussie team mate Tonn Haydon thrashed him around for an hour and he was good to go. Day one started off just as we could have hoped, with a stacked gate, this would be a test and he passed it with a 2nd, following up with a 3rd, then another 2nd, happy days. Now though to where the money is earned, the knockout stages. Quarters are always a nervous time, but Finn sailed through with a 2nd and on to the Semis. A great start, 4th into first berm, he just needed to hold it and we’re through, but no, the boy wanted some more and snatched a 3rd on the line. The A final, no matter what, this was going to be tough, and it was, from the start. Holding 7th for most of the lap it was tight, and that was proved with a tumble in the final berm, thankfully Finn just missed it coming home with a 4th, thank you Lady Luck. Race day 2 saw a couple of riders dropping out because of injury we were down to 30 riders, which meant straight cut to semis. This meant consistent laps and no mistakes, he started off meaning business bagging a couple 3rd’s. With only a top 6 needed to guarantee a transfer spot Finn pushed to the line for a 4th. Semis and not a great start, there was a lot to do in 6th, but 4th was in touching distance, jumping into the second berm and almost hitting the riders in front the disc brake did its job, but it was game over with too much to claw back, but the boy never gave up as always to the line and made one place to the dreaded 5th. So, it was B final time, a good opportunity to gain some valuable points and everything was still to play for. The names in it were crazy, it could have been an A final. A great start and Finn was in the mix, all the riders were giving it everything and the drive out the final berm was the key, a great drag race until the end, boom 3rd place, happy days. All in all, a great weekend with some serious points gained. Telford national is the race Smiley had been waiting for all year. He said “The weather was perfect, possibly a little windy, but trust me it’s been a lot worse there!” He was at the track at 2pm on Friday to meet up with the team and help set up. Smiley was a bit unsure about how the weekend was going to go, as this was his son’s first time watching him race and he wasn’t sure how Harry would be. Smiley had a few practice laps on Friday, which went well, and came back to be told Harry has been as good as gold, so hearing that put him in a better frame of mind. Saturday morning and Smiley was feeling pumped and ready to go, but had seen there was some seriously tough competition. It was set to be the hardest race weekend so far of this year’s national series. In the 1st moto had had gate 8, with a short and wide 1st straight, it was going to be tough. He had an amazing gate and got across to take the win. Moto 2 was also going to be from the outside, coming from lane 7, so just as hard, but he managed a 2nd, with another 2nd in Moto 3. Semi time and Smiley chose gate 1, but sadly was shut down into the first berm and ended up in the dreaded 5th. Through to the B final and a killer 2nd berm move saw Smiley take the win. Sunday, the temperature was up and he was feeling it! Smiley spent a lot of the day helping the club water the track, which probably took its toll. The motos went very well with a 1st, 2nd and 3rd. Semi time, and he needed this, getting 5th on Saturday had hit him hard, time for some redemption. Hearing in the pens “no, Smiley’s in this one” just added that bit of fuel to the fire, the date dropped and he rode a very good lap, finishing 3rd. Smiley said “The main was by far the hardest race I’ve ever done”. From gate 1, feeling a side wind, his mind was on that and he didn’t get the gate he was hoping for and ended the race in 7th. He said “certainly not my best result, but I was happy with it. Massive thank you to the team for my support, but more importantly to me, making Harry so welcome and keeping an eye on him while I raced”. 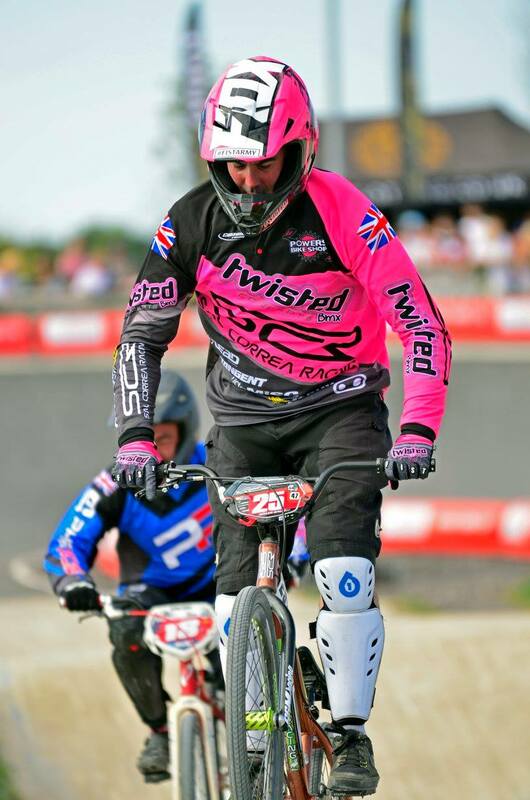 Representing Twisted Concepts Australia, Tonn had visited England to race a few years ago, so he was no stranger to the UK BMX scene and has quite a few existing friends here, but he had only met the Hallett family a few days before racing and nobody else on the team at all. It was definitely very interesting to get his take on a UK national, as he is an extremely well-travelled rider who has raced all over the world. Tonn struggled a bit with the speed of the Bensink gate, he said they are way faster than the gates he is used to in Australia. He felt like had good track speed, but he was always playing catch up after bad gates. The highlight of his racing in the super-tough combined 25-29 and Master’s class was the 3rd place he pulled from Lane 8 on Saturday. He is now feeling super motivated and may change his travel plans to get back to the Gosport National, and we would love to have him with us. Tonn is such a cool, easy-going guy, fantastically easy to get along with and helpful with his team mates, always offering good advice if it is needed. He absolutely loved meeting everyone in the UK team and had an incredible weekend, and is super thankful to everyone involved in it. Telford National, Richard’s favourite national of 2018 so far, being a shorter, tighter track, it made for some great racing. 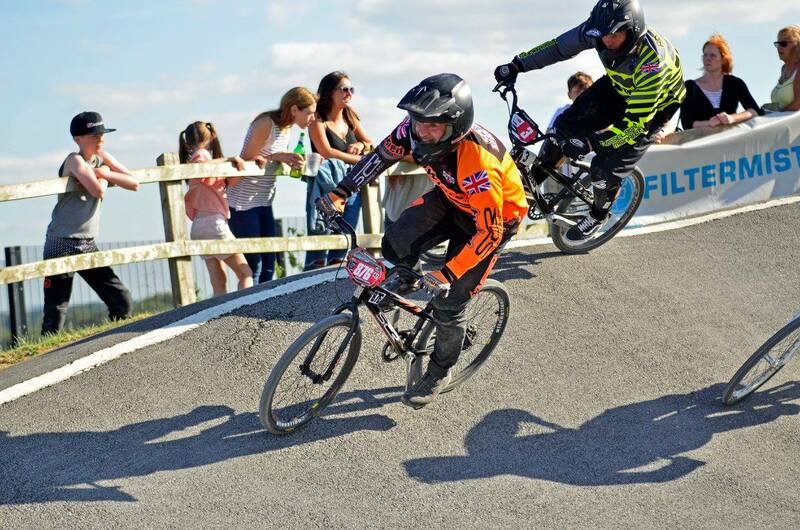 He registered for both classes and was keen to see where he was at on the BMX as it was his first national of the year on his preferred 20” bike. Rich thought, as usual, that the team setup and location were on point. He was consistently finishing in the top two in moto’s on the Cruiser on both days and ended up with a 4th and 2nd respectively in the finals. He was a little disappointed with the 4th, but he will openly admit it was a terrible lap, making several mistakes down the third straight. After missing the Glasgow rounds Miles was itching to get back out on the national circuit. He’s been getting some great solid results in the South and London recently and he was hoping to carry that form over to the big stage. Friday practice went well, his gates were looking strong after switching back to listening to beep, rather than watching the lights, he also got the jump into the first berm done early on, so he had plenty of time to get comfortable on it, so things were looking good for his assault on the Vets class. As far as results went both days were similar, Miles rode very well in the motos throwing corner moves and smoothing out straights, getting good results in tough races. Both days he just missed the gate in the semi and couldn’t cut though the pack enough to make the A. Both B finals turned into pure BMX pantomime though. Day one he was in second going into the final turn pushing for the win, when he was swooped and shepherded off the corner and sent cyclocrossing down the side of the track, so for a giggle he kept on sprinting on the grass, much to the crowd’s amusement. Day two Miles was weaving through the pack heading to the front down the 3rd straight when a rider next to him lost control, Miles is a great advocate of the disc brake and it was called into action, he pulled a 180 skid up the take-off of the next jump, which sent him running across the infield and he decided to play the joker again and did a little jig for the crowd which went down very well. 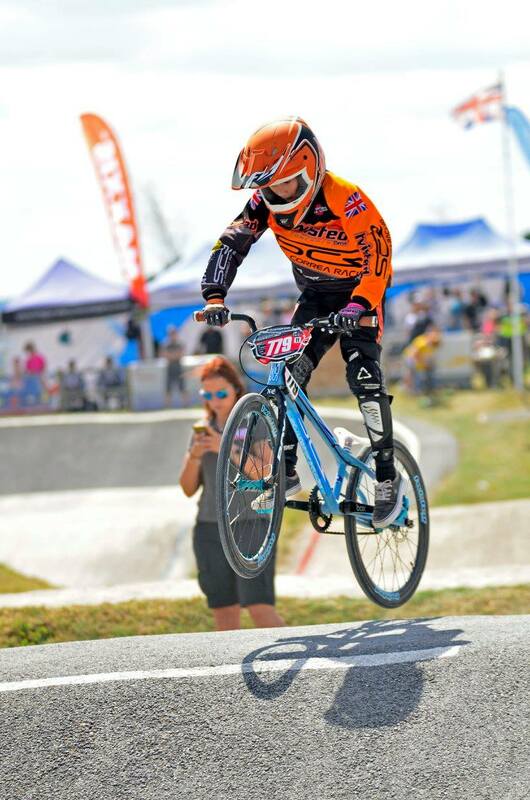 You can’t always win in BMX racing, but you can always try your hardest and have a lot of fun doing it, which is what Miles did this weekend. Miles was also presented with an official Lord title by the team for his birthday, so now he must book the team meals under the name Lord Kirby! This also amused the commentators for the weekend, who got news of this on social media and he has now picked up the new nickname ‘Lord Squirrel Nuts’! Not the best weekend for the physics defying big man. He started the Saturday at Telford on the cruiser getting knocked off down the first straight in the motos, but still he had the results to make the semi. Spencer had a great semi taking 2nd, so he was happy to make the main. He had a poor gate in the main though and couldn’t battle though, so 8th it was, but he was happy to be there. After a good practice session on Friday, things were looking promising for Myles. After a rough couple of months his BMX mojo was coming back. Saturday warm up, he thought gates were on point. Moto one he got a stonking gate and was in a drag race over the first jump, as the second approached he was reminded of his rookie national status and the door was firmly slammed on him. This set the tone for day one and he was moto’d. The moto’s on Sunday were going well, until 3 bikes tried to fit a gap for one, unable to avoid the carnage he crashed into another rider and bike and smashed his tiny foot into the floor, ending up 6th. Stopping to check the fallen was unhurt was a decision he’d later regret. Moto 3: got his best gate ever, he held his nerve and got a solid 4th place. Missing the cut by only one point was a gutter, but showed he’s making good progress. Please pop by to see us at Gosport National, we’ll be more than happy to show you what we believe are the best factory race bikes there are. We’ll have Twisted signature FIST gloves for sale, possibly the odd giveaway, our signature 3K weave carbon to look at and buy, plus all hardware on show. We are also the European service and warranty centre for Onyx, we only use Onyx ceramic bearings and the same Teflon grease used in the Onyx factory, so your hubs will literally come back like new. Remember if you order hubs from us we can do them in nearly any conceivable colour combination and custom laser etching is complementary. We now have SCR frames in all sizes, disc specific or V brake, and if you’re looking for a special colour and decal combination we can sort that out, no problem at all, with our custom painters and special relationship with ENV Graphics. We would like to thank our sponsors and team partners Crank Brothers, Powers Bikes Shop, Lead Racewear, Custom Racing, Tangent race products and ODI Grips.